Being a Wardrobe Supervisor means being resourceful. Coming up with solutions is an important skill that’s necessary at every turn on a set. When a product comes out that solves a very basic, ongoing problem, it’s like striking gold. Hang Check is one of those products! All Wardrobe Supervisors know the problem of hangers slipping all over the place on racks, especially in transit. You go out of your way to get everything organized, only to find a mess when it’s time to wheel the rack off the truck. Forget wasting all that gaffer’s tape trying to secure your costumes on the rack. Hang Check is a long plastic cover that snaps on over the rack, keeping everything aligned and orderly, just the way you like it. Looping clothes pins can function as dividers and place holders. Each Hang Check comes with two and additional are sold separately. They easily loop around any size rack and are an organizational dream. Once you’ve arranged your costumes just so, put your looping clothes pins in place, snap Hang Check on and go. Your rack will arrive just as you set it up, and you can easily snap Hang Check onto the side bar for storage when not in use. 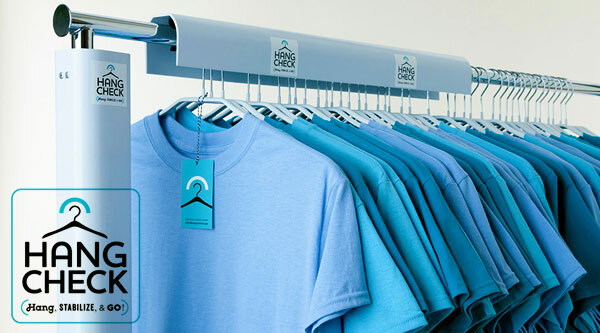 Hang Check can accommodate most kinds of hangers, so just about all of those stragglers that make it onto your wardrobe rack will be secure. It’s also easy to secure a plastic cover to keep it dry in rain, snow or whatever weather conditions you’re working in, or a dry cloth to keep it protected from prying hands or whatever might be flying around on set. Hang Check let’s you use your imagination for the million other circumstances that need your attention on set. Why didn’t somebody think of this before??? We don’t know the answer to that one, but we know you’ll be glad that somebody finally did! Tagged Hang Check, organizers, solutions, wardrobe, wardrobe department, wardrobe supervisor. Bookmark the permalink.